Saturday is Carol’s birthday. 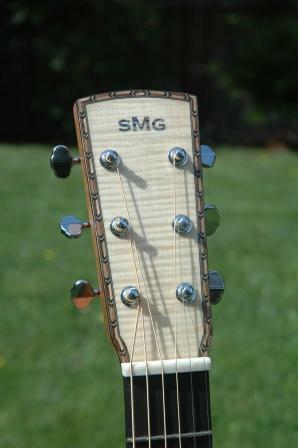 It was not my intention to finish her guitar for her birthday, but circumstances have allowed this to be coincidental. So, happy birthday Carol, here’s your present. 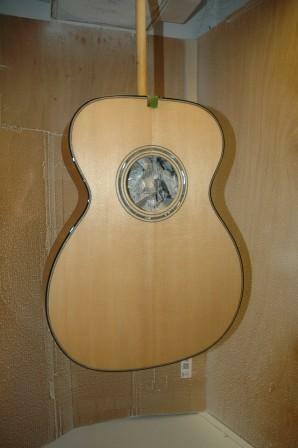 I’m reluctant to say any guitar is finished. There’s always more to be done, so I’ve decided I won’t declare completion, rather turnover. I turn the guitar over to you Carol, and fortunately, I’m very near, and can do all those tweaks and changes that scream out to be made. 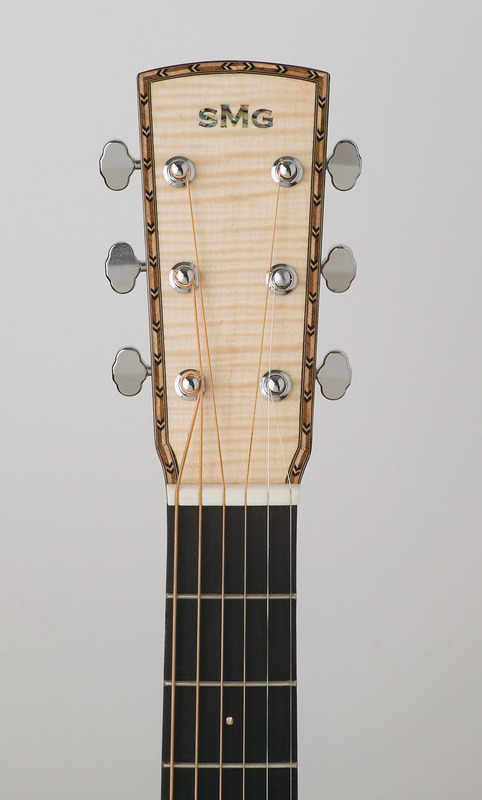 Like that little buzz on the 9th fret on the first string….if it doesn’t heal itself, I’ll work it out for you. It’s now in your hands, and I hope you play it often. 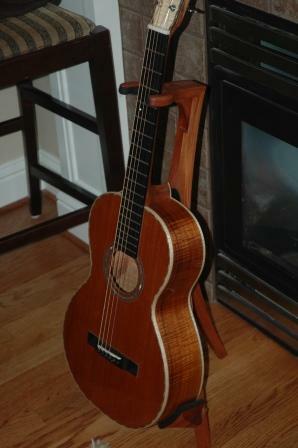 It should be our family room guitar, always in the stand right next to the couch, so you can pick it up any time your laptop is rebooting, and play a little tune. 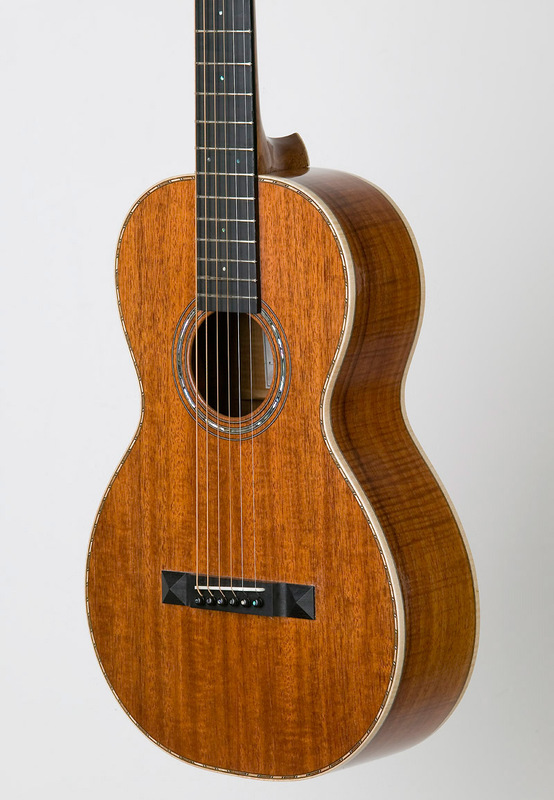 Guitar 902 – Koa/Mahogany Parlor has strings! Beth! 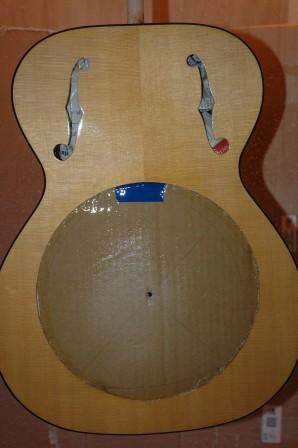 This progress on Carol’s guitar means yours is next. 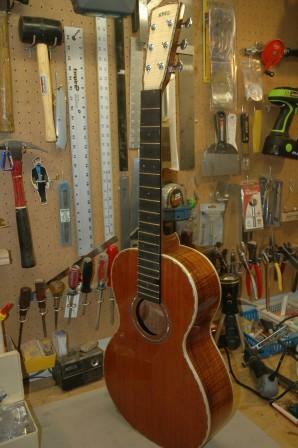 As of tomorrow, it will be buffed, neck installed and bridge installed waiting for strings. I learned a whole lot while finishing and doing the setup for Carol’s guitar, at least about the value of making sure all glue squeezeout is fully washed off before drying. 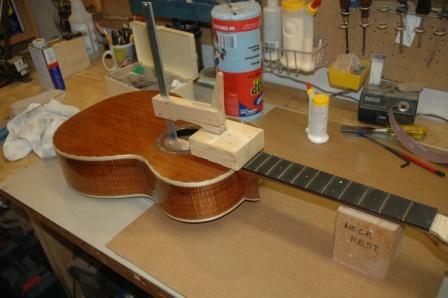 Guitar 902 has all components installed and is ready for detailed setup and cleanup. 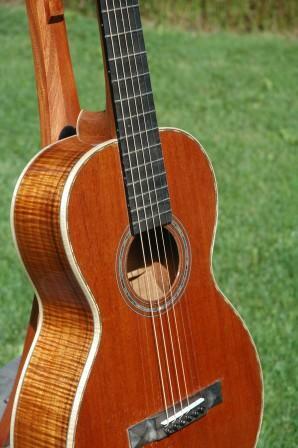 The strings are on, the saddle is roughly to shape, the nut is notched and dry fit onto the neck, and it will sit with the strings on for a few days, to settle in, before I fine tune the setup, trim the frets, level the frets, crown the frets, and polish up the fretboard. 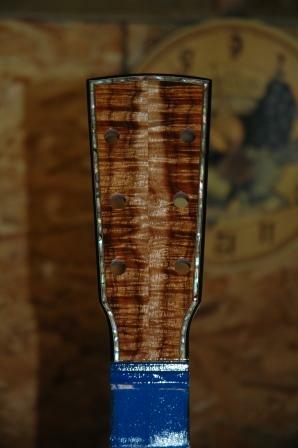 The bridge needs to be “blackened” (ebony these days can be a little streaky), and the body needs to be resanded and repolished to remove the detritus from the neck and bridge install. Finally, the body grunge will be evacuated with compressed air, and the wonderful sMg label will be installed, and Carol can wrap her stubby little fingers around it and play her Joni Mitchell songs. 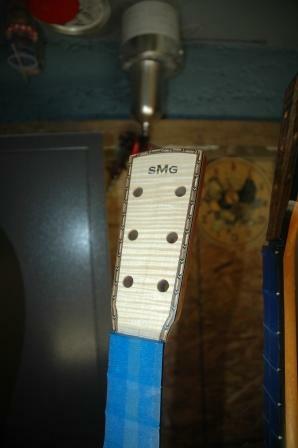 I’ve been working on revitalizing the finish and cleaning up the fretboard after installing the bridge. I tried rebuffing after installing the bridge, but I think the answer is to do some 1200 wet sanding again to clean up some of the glue which got onto the lacquer. 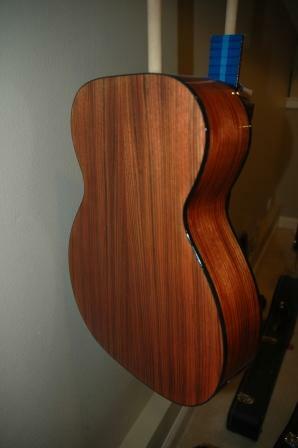 After buffing and installing the tuning machines, I dry fit the neck onto the body to score the top where the fretboard meets the top. 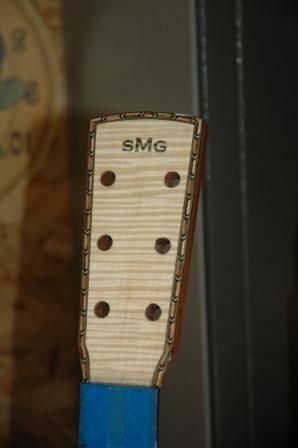 I will use this score mark as a guide to remove the lacquer to allow gluing the fretboard to the top. 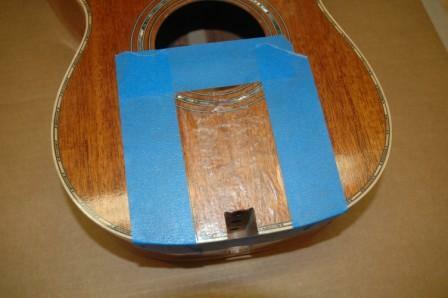 After scoring and removing the neck, I masked just outside of the score mark and applied lacquer stripper. 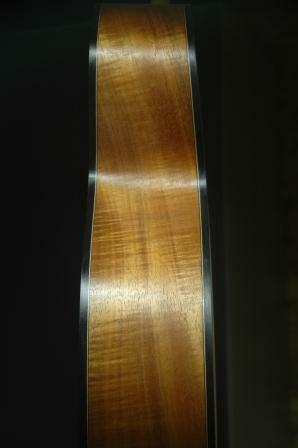 3 applications were necessary to fully free the lacquer, which I scraped using a 1/2″ vertical chisel. 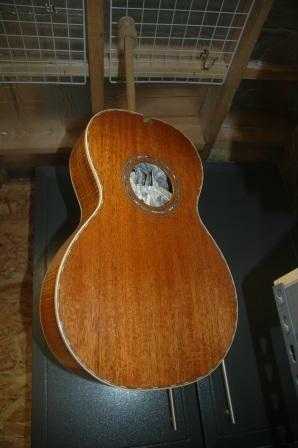 Once the stripper/lacquer was fully removed and washed with water, I applied glue to the top, slipped on the neck, tightened the neck bolts and clamped the fretboard. This will sit for several hours before moving on to the bridge install. 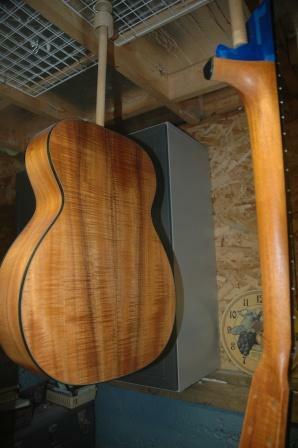 Applied the final coats to all three mentioned guitars, and now they will sit for 2 weeks to cure. I just returned from Guitar Camp. It is always an enlightening experience. 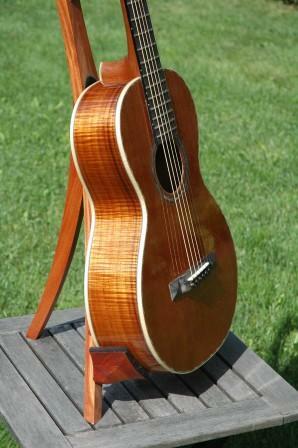 Got a good chance to show off some of my wares and do a lot of lutherie talk. Check out the links section to see the PSGW site with info about camp, teachers and schedule. Before I headed off to camp, I ran out of lacquer. As lacquers all have their special formulation, I wasn’t able to find anything locally, so had to order McFadden online. It had arrived before I returned home from camp, so was able to resume the spray cycle today. 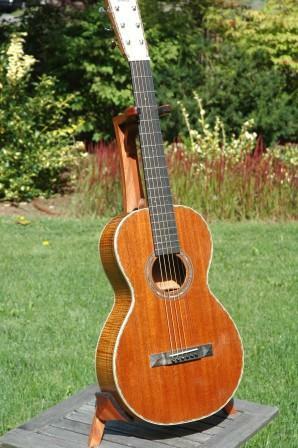 I’m on 10 11 12 for guitar 901, the resonator. 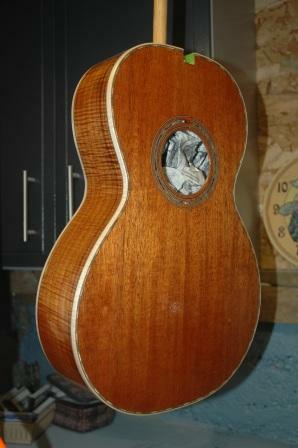 Once I get those last coats applied today, it should sit and cure for several weeks before final sanding and buffing. 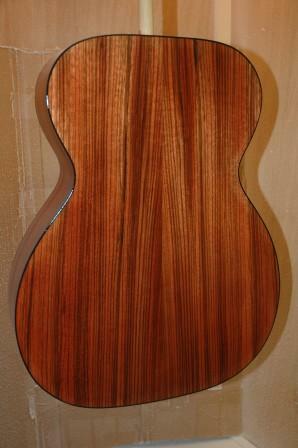 For 902, the mahogany/koa parlor, and 904, the koa OM, I’m on 7 8 9, with a final application of 10 11 12 tomorrow then followed by the curing. I’m getting much better with the lacquer application, and I’ve got the wet coat without drip application almost perfected. 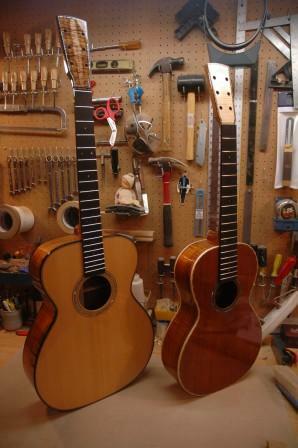 This trio of guitars will have my best finish yet, and dangerously close to perfect. I’m becomming more and more dissatisfied with my spray booth location within my workshop. Even though I’m using air venting and exhaust fans, and isolating myself in the back inside a shower curtained stall, the spray dust escapes and gets on everything in the shop. It’s bad enough to have wood dust everywhere without the spray dust. I’m not sure what the solution will be, but I’m on the hunt for a better location within the house. 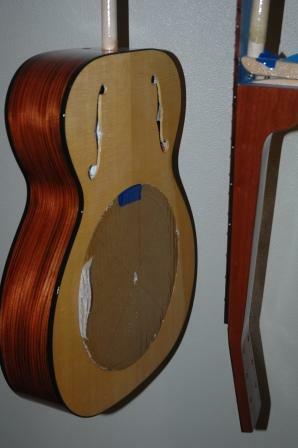 In the meantime, I’ll use the current booth to complete the spraying on these 3 guitars. 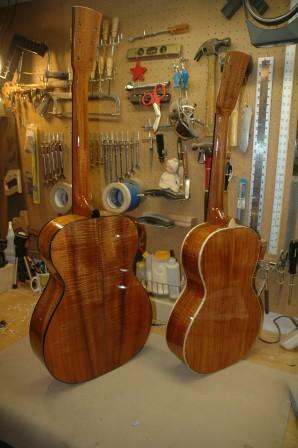 Three guitars in the spray booth for another session today. 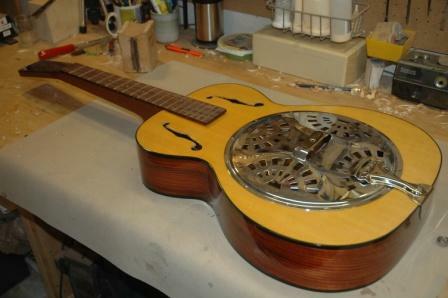 The Resonator, 901, got a ninth coat of lacquer. Before I spray 3 more, I’ll see if there’s a need for any gap filling. 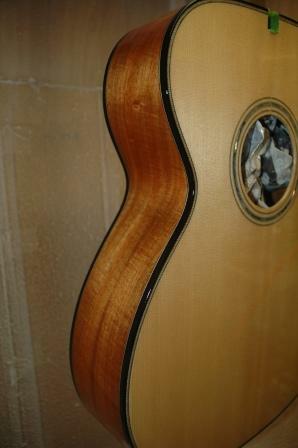 Not sure if I’ll try and fill the gaps with lacquer or epoxy, depends upon presence and severity. 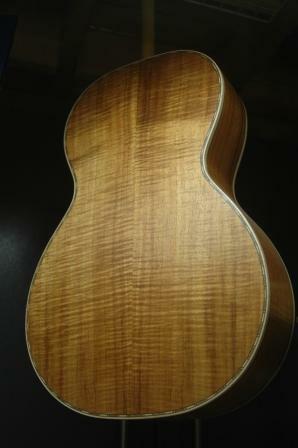 The Koa Parlor for Carol (902) is really handsome. Carol sez “old country”. This is after the 6th coat. 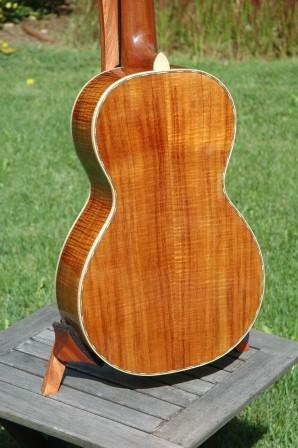 Beth’s OM (904) is also on the 6th coat. Tomorrow: Coats 7 through 9. 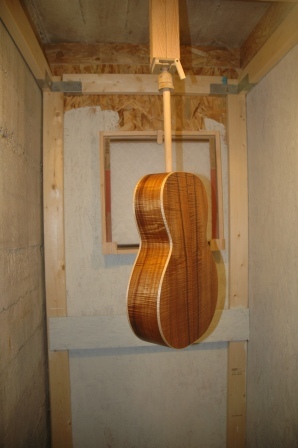 I’ve been distracted from getting into the spray booth because of Carl’s guitar. I can see a pattern here. What I really like doing is the preliminary stuff, and by the time I get to the finish and setup, I’m easily distracted. 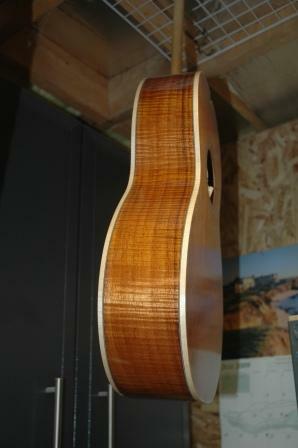 I had planned all along to start the spraying of 3 guitars ready for the booth since last Monday. It’s Friday, and I finally allowed myself to do a lacquer session. 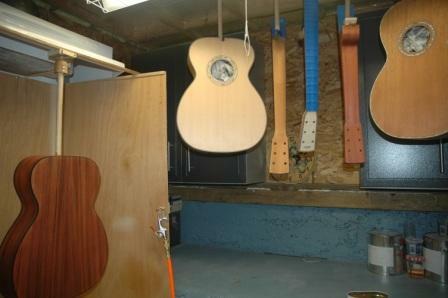 I got 3 guitars prepped for spraying, finally, by end of day yesterday: 901 – the Resonator which has already been sealed and grain pore filled; 902 – Carol’s parlor ready for sanding sealer; and 904 – Beth’s OM. Here they are waiting to be sprizted. 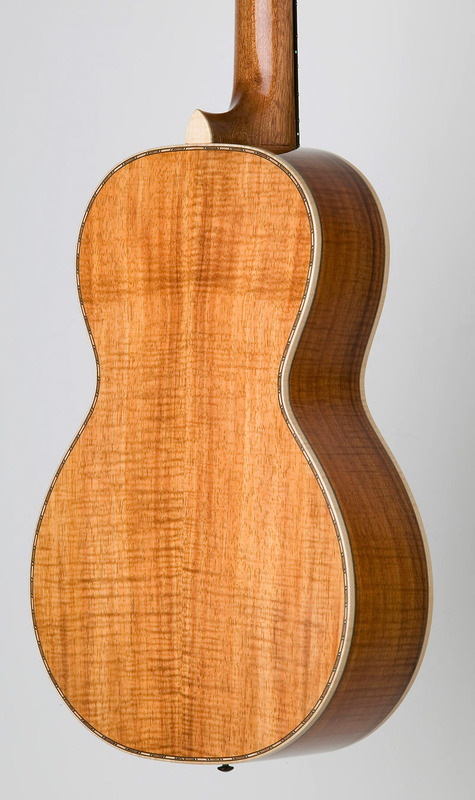 First the resonator, then the two koa’s. 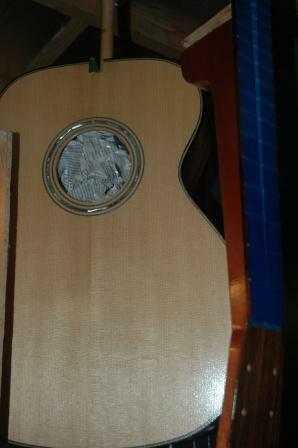 After each received one coat, I finished with two more coats on the resonator as it’s in the layer the lacquer phase. 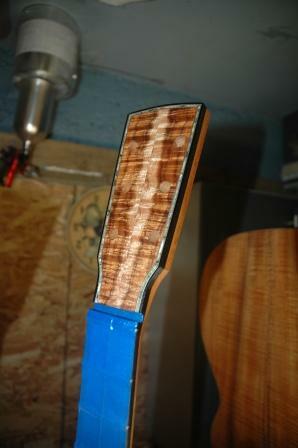 The sanding sealer for the two koa’s is the prep before the grain pore filler, which I will do tomorrow morning. 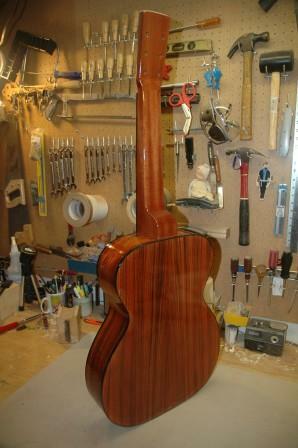 Carol’s parlor with the first coat………. This is all just a precursor of how that koa is going to shimmer. I’m very happy. 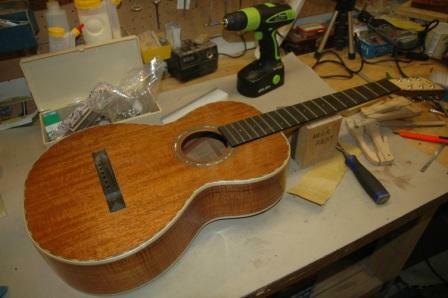 Carl’s components arrived today, and I’ll balance the waiting for lacquer to dry with actual guitar construction.